Today is a good day for font lovers. 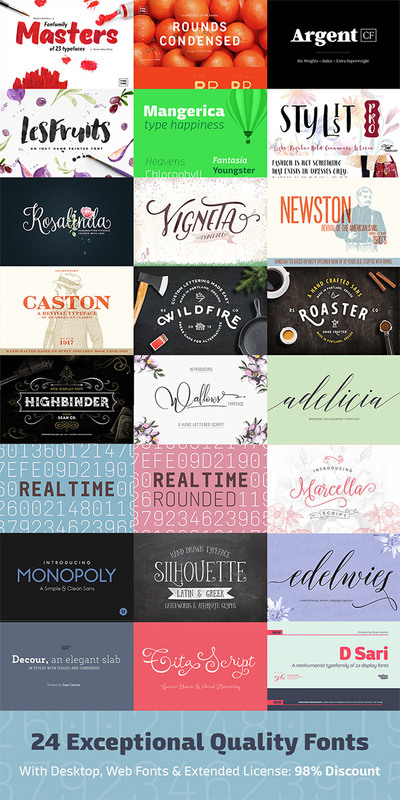 A brand new fonts bundle has just gone live over at Design Cuts and this one is a whopper! 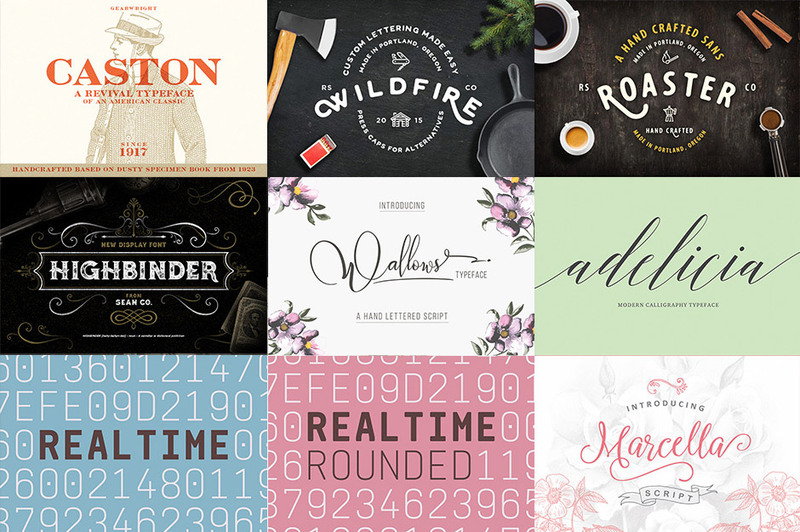 This latest deal is a collection of 24 fonts that have been hand picked for their exceptional quality, then slashed with an unbeatable 98% discount and given the best license terms available anywhere to provide the ultimate value for money. Here’s all the figures you need to know: 24 incredible fonts; $1237 total value; 98% discount; you only pay $29; expires in 12 days! This bundle focuses on quality and has been negotiated with some of the most talented designers and type foundries who have supplied their best fonts for the collection. A single font family of this calibre usually sells for hundreds of dollars when you factor in the extended licensing and web fonts. I always get asked what fonts I used in my designs. Almost every time it’s a font I picked up from a previous Design Cuts deal, so you can expect to see some of these new typefaces appearing in my work in the near future! Wallows is one beautifully elegant handwriting typeface. It almost makes me want to get divorced so I can re-marry my wife and design a whole new set of wedding stationery with this font! Wallows expertly uses ligatures and alternates to capture the hand written style and add decorative swooshes to customise each word. Dsari is a great example of why premium fonts cost so much at their regular price. A lot of time and expertise has gone into crafting this complete family of 22 neohumanist fonts from thin to ultra black weights. With typefaces like this you can create professional design work with nothing but the type tool! I love having fonts in my collection that are based on a specific era to make it easy to create retro or vintage style designs. This Newston font is as authentic as you can get! It’s a digital revival typeface from a 1923 American Type Founders specimen book. Love those vintage illustrations in the previews? They come with the font too! Les Fruits isn’t just a gorgeous brush font, it’s basically an entire kit of design resources for creating trendy graphics. With the range of watercolour and foil swatches/styles for Illustrator & Photoshop, along with 5 real ink splatters (and the font itself) you’re ready to create awesome logos, posters, greeting cards and more! Highbinder is a cool display font based on the prohibitionist era and comes in clean and rough variants. This is the perfect choice for dark vintage styles, such as a liquor bottle label design like those in my recent inspiration showcase to tie in with the prohibition theme! This is just a short review of my picks from the entire bundle of 24 fonts. Be sure to check out the deal page on Design Cuts to see the full value of what’s on offer. Remember this deal also contains extended licensing and web fonts for every typeface, which means you’re fully covered for using the fonts in your commercial work (even web designs) and items you want to sell. Oh my God! i can’t believe I missed this deal!! I just saw this post! do you have any idea if they’re running this deal ever again?! This is really an affordable offer for everyone.. Thanks to design cuts for this grand offer and as well you chris for keeping us update..
My pleasure Kristina. I look forward to their font bundles every time. Although I now have so many I’m spoilt for choice! Thank you for your awesome posts, Chris. I have never missed a bundle by the motivated DesignCuts Team. They’re doing an excellent job by choosing amazing textures, fonts, actions, patterns etc. – the offers are gigantic! Great set of fonts and thanks for posting. I’m always after new font inspiration and I’ve a huge fan of the hand written type fonts. Really good and I’ll be sure to share with my peers.